We’ve been keeping a running tally of where distributed generation has come under attack, usually from incumbent utility companies, and displayed it in map format every few months. But the North Carolina Clean Energy Technology Center and Meister Consultants Group have done such a good job with their 50 States of Solar reports, that we’re going to piggyback off their work and highlight the “lowlights” of “DG” under fire below. The battles between utilities and their customers over the right to self-generate aren’t cooling off, either. Utility Dive notes at least 10 states will be on the front line of the battle between utilities and their customers in 2016 and beyond. If utilities had realized the disruptive effects of distributed solar, they likely would have acted to quash it years ago. But realizing that solar continues to become more cost-effective each year, that the size of the solar market is going to grow exponentially, and that it’s still politically feasible to resist, many utilities are seeking limits to their customers generating solar electricity. Why? Although solar creates local economic, social, and environmental benefits, it erodes profitability for major utilities that remain tied to a 20th century business model. Capping or knee-capping net metering. Net metering is the general way to reimburse rooftop solar production. Basically, whatever energy the solar panels produce gets credited on your bill against whatever energy you use. Legislators, regulators and utilities are now lowering the rate at which solar production gets reimbursed and setting caps on how much is allowed — largely without taking a look at the values that solar adds to the grid and local community. Reducing compensation. Adding a fees to all users, or to just those that put up solar, is something that utilities in as many as 30 states are proposing. These demand-based charges or fixed monthly fees greatly reduce how much energy a rooftop solar installation can offset. One fixed fee proposal in Wisconsin would have reduced the potential savings of a solar user by ¼ . Limiting non-utility ownership. While third parties can now offer solar purchasing agreements in Georgia, other states have fought with great fury against third parties. For example: in the face of a ballot initiative to allow third-party solar, Florida Power & Light designed a confusingly-named, seemingly pro-solar ballot initiative to ban third-party solar. And just because it’s egregious, Duke Energy is threatening legal action and calling on the state to fine a church that put up solar panels through a third party. Nowhere is the distributed energy battle more intense than in Nevada, California, and Hawai’i. Last December, the Nevada Public Utilities Commission killed net metering by significantly lowering the reimbursement rate to customers. They added a fixed fee (gradually tripling in cost over the next few years), increasing the amount customers will pay each month regardless of their energy use. They made it retroactive to all solar users. It was a shocking reversal of public policy, and even actor Mark Ruffalo pointed an angry finger at the commission. Citizens for Solar and Energy Fairness is trying to overturn the ruling by by collecting signatures to force a public referendum. Another group, backed by NV Energy, is trying to block that effort with the disproven argument that solar net metering is unfair. The Nevada Public Utilities Commission found two years ago that net metered rooftop solar imposes no significant costs on non-solar users. California also killed net metering — kind of. 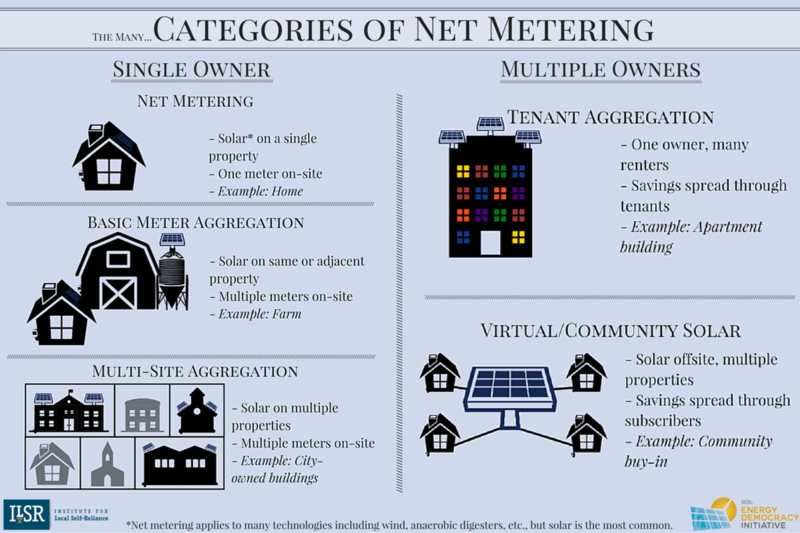 It requires utilities to make solar available to residents of multi-tenant buildings through virtual net metering and aggregated net metering. The Commission decision is a sweet-and-sour deal for electricity generators/consumers. The non-bypassable charges add up to 2 to 5 cent per kilowatt-hour, reducing the energy savings from solar. Electric utilities can also change their tariffs at-will, lowering the amount that solar becomes reimbursed at while increasing demand charges, as Southern California Edison did back in January for (below, kudos to Sage Energy). 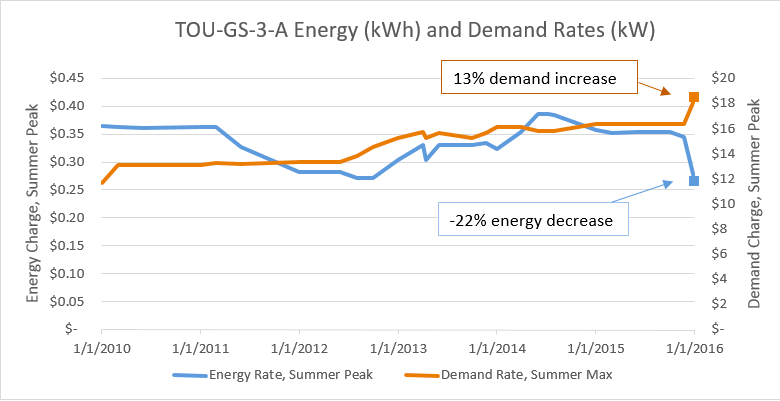 Demand charges are like an access fee, a fixed price on the bill associated with the customer’s peak energy use in a given time period, rather than the amount they are actually using. California’s net metering “fix” will be revisited in the next few years, setting up another showdown. Given the incredible growth of customer-owned solar — more than 15% of Hawaiian households have it — and the political power of the incumbent utility, it should come as no surprise the Hawai’i also killed net metering. Effective last October, new rooftop solar users of the Hawaiian Electric Companies are no longer reimbursed at the retail rate (somewhere in the $0.25 to $0.35/kWh range due imported fuel oil-driven electricity prices). Net metering is now split into a grid-supply option (reimbursed at roughly half the rate as before) and a self-supply option. For the former, the chosen reimbursement rate is much lower than evidence should allow. For the latter, customers get no compensation at all for solar energy that spills onto the grid, but must structure their usage (or buy a battery) to use as much of it as they can on-site. The new rule isn’t popular. It earned an “F” grade from FreeingTheGrid.org. To Jeff Mikulina, the executive director of the Blue Planet Foundation, it “takes Hawai’i a step backward.” Others note it greatly reduces the financial viability of a rooftop solar project. Solar developers in Hawai’i are preparing to downsize their staffs. The rule sets a cap on how many projects can qualify for grid supply. The new cap on O’ahu is 25 megawatts — perhaps meager for an island in which 17% of customer already have rooftop solar (below). The decision also comes after years of solar interconnection delays based on technical concerns that were ultimately proven unfounded. 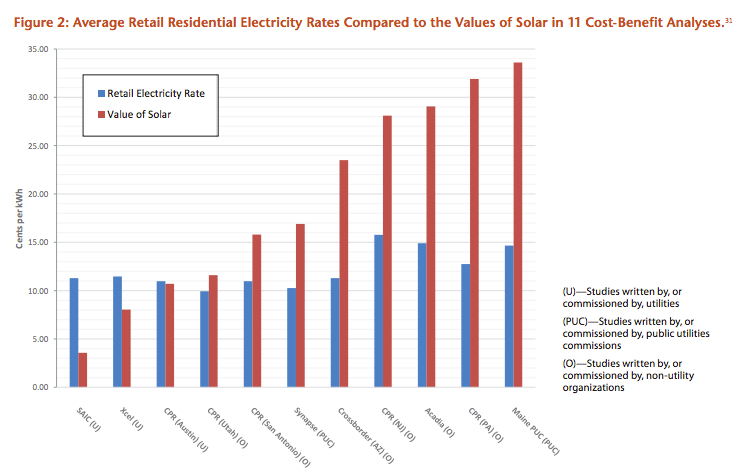 Although the new grid-supply compensation rate may more accurately represent what rooftop solar is worth than the retail energy rate, there’s plenty of evidence it’s too low.. It may be that the self-supply option will be the more popular, since solar-and-storage is now economically viable on the islands. The Commission’s order also requires Hawaiian Electric to develop time-of-use rates that, with more specificity, could accurately price the value of rooftop solar electricity. 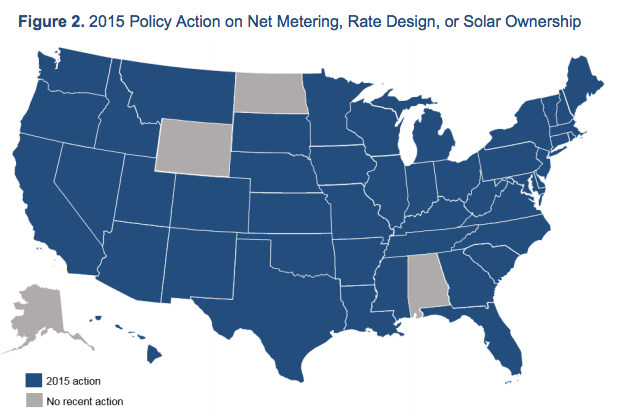 The next iteration of net metering doesn’t have to be a zero sum game. Beneficial compromises are in reach. More than a few utilities have embraced rooftop solar and made it work in their business models. The super-small Farmers Electric Cooperative in Iowa sports a feed-in tariff to support one of the highest solar densities in the nation. Green Mountain Power, in Vermont, is a regulated monopoly utility — even while lowering rates three times in the past four years, the utility sought to raise the state’s net metering cap last year and pays a premium over its retail rate for solar electricity generation. 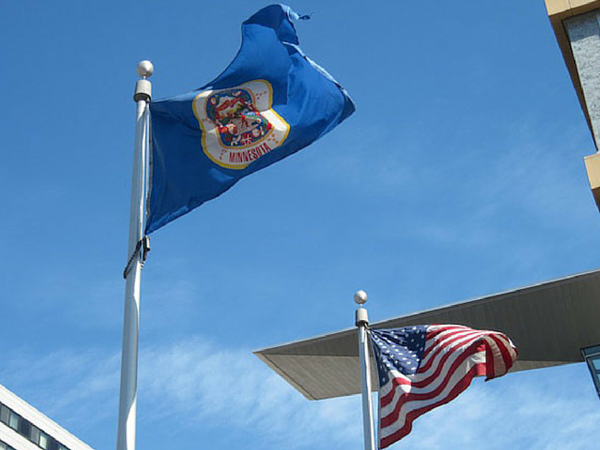 Minnesota’s adopted value-of-solar tariff offers utilities a fair price for solar, but none have yet chosen to replace net metering with the new scheme. Other ideas are developing. Now in New York, utilities and solar companies are coming together for a new net metering proposal, one that calls for solar companies paying for a portion of net metering charges. It’s a welcome shift between two usually antagonistic parties, but Karl Rábago, head of the Pace Energy and Climate Center, says the proposal could potentially exclude smaller players from participating in the new electric grid. The changes to net metering will obviously benefit somebody. Regulators across the nation have the privilege of deciding who exactly that “somebody” is, and the responsibility to make it in the public interest.